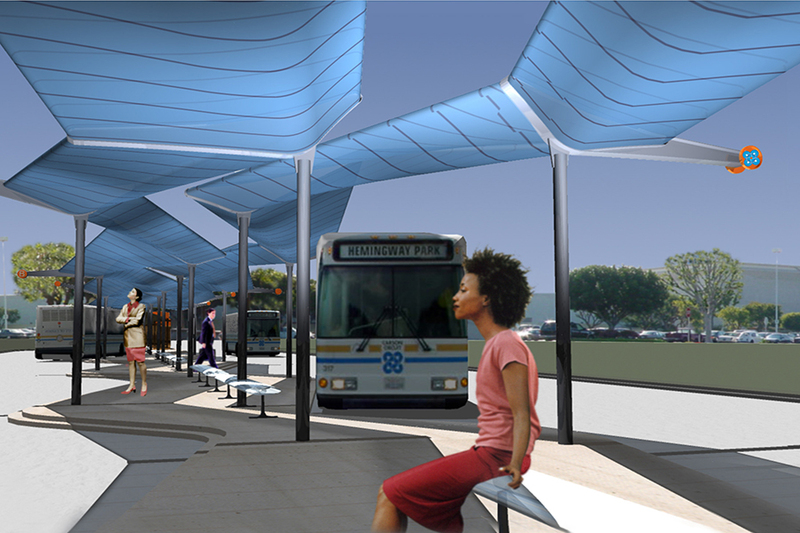 The South Bay Pavilion Transit Center is a 30,000 SF modern facility that provides direct access to the local Carson Circuit Transit System while folding in the surrounding regional systems connecting the Circuit’s 616,000 annual passengers throughout Los Angeles. A joint effort between a public agency and a private commercial shopping center, this $1.4M project was designed to enhance the value of this property by providing the area with contemporary architectural forms, shade structures, benches and landscaping elements; and improved traffic planning including the layout of 10 bus stalls and surrounding parking areas. An office and kiosk for the Circuit supervisor anchors one end of the project, with a digital billboard with passenger information and schedules at the other end.